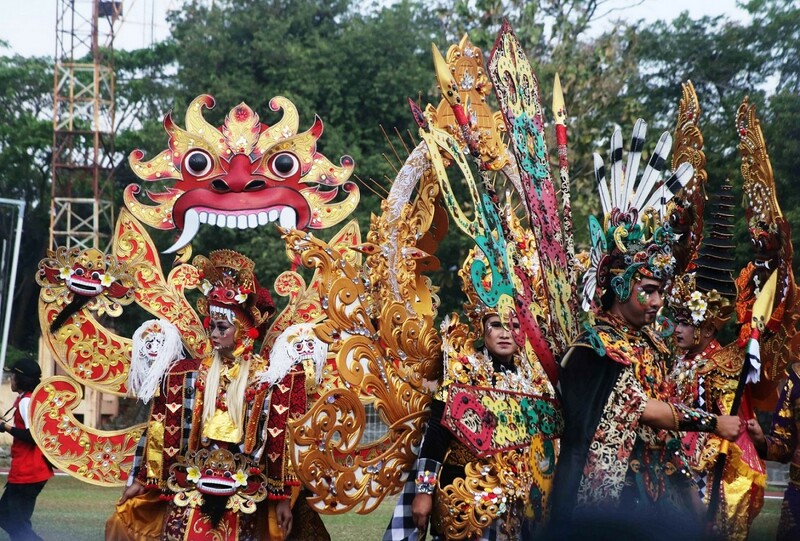 Some 300 participants joined the Solo Batik Carnival in Surakarta, Central Java, on Saturday. The carnival was filled with creativity as shown through each featured costume, with batik as the main material mixed with recycled clothing designed and made by the participants. After a fashion show in the Sriwedari stadium, they formed a 4-kilometer procession to Vastenburg Fort. Ika Paramartha was chosen as the main theme. The word ika was taken from Indonesia’s national motto Bhinneka Tunggal Ika (Unity in Diversity), while paramartha represents the good things that bind the country together. Eight sub-themes highlighted the Indonesian regions of Lenggang Batavia (Jakarta), Jawa Dwipa (Java), Nagari Minangkabau (Sumatra), Mapalili Mamiri (Sulawesi), Dayak Borneo (Kalimantan), Tiara Dewata (Bali), Sasando Timor (Nusa Tenggara) and Tana Sajojo (Papua). During the parade, thousands of people flocked to Surakarta’s main street of Jl. Slamet to catch a glimpse of its various colorful features, from the ondel-ondel (giant Betawi effigies) to the black and white checkered cloth of Bali. Meanwhile, participants in the Nusa Tenggara and Sulawesi section performed their traditional dances. “We chose unity as the theme because we are blessed with so many wonderful features that make Indonesia a country with dignity; they must be united,” said Surakarta Mayor FX Hadi “Rudy” Rudyatmo. Sari, a 20-year-old participant who wore a Betawi costume, said she had designed the outfit herself in January and began sewing it in April. Rahajeng, 19, another participant, said this was the third Solo Batik Carnival she had attended. This time, she wore a Balinese costume, mixing the black and white checkered cloth with patches of batik. “It took me four months, from designing to sewing, and it cost me around Rp 2 million [US$139]. I am so pleased with the costume,” she said. The carnival was also marked with a performance by renowned singer Trie Utami, who sang her hit songs while participants graced the catwalk.